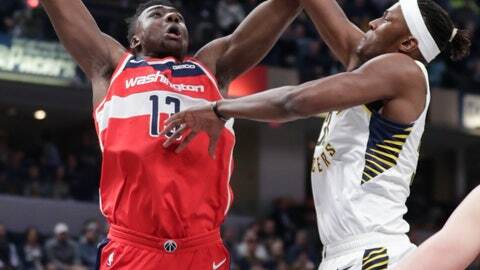 He was 11 of 16 from the field and finished with five blocks — three on successive Wizards‘ possessions that helped Indiana take control late in the first half. The last one prevented Washington from taking its first lead since the second quarter. Wizards: Beal scored 19 points in the second half and reached the 20-point mark for the 20th time this season. … Otto Porter Jr. left midway through the first quarter with a bruised knee and did not return. … Thomas Bryant, who attended Indiana University, had 10 points. Pacers: Turner has recorded double-doubles in four of the last six games. … Bogdanovic topped the 20-point mark for the eighth time in 14 games. … Collison had 31 assists without a turnover over a three-game stretch before committing three turnovers in the final six minutes.